The outbreak of the war in Europe in September 1939 had little impact at DePauw or other American colleges, where both academic and social life continued for the most part on its usual course. The intellectual climate on campus reflected the political isolationism then so prevalent in much of the nation, particularly in the Middle West. It is true that since the mid-1930s increasing attention was being paid to current events in Europe and Asia in chapel and convocation programs as well as in certain courses in the college curriculum. International affairs, however, probably seemed very remote from the interests of many undergraduates of that time, who were presumably more concerned with the immediate problems of economic recovery at home and jobs after graduation. Under the Selective Service Act passed by Congress in September 1940, DePauw men 21 and over registered for the military draft, but few were called up because of the law's liberal provisions for deferment of college students. As the war went on, campus polls revealed a strong measure of sympathy for the Allied cause but little inclination toward either personal or national involvement. In 1940 a half dozen professors joined the Indiana Committee for Defense, a body affiliated with the ardently interventionist Committee to Defend America by Aiding England, while most remained on the sidelines. By November 1941 the DePauw Alumnus could report that 45 graduates of the university were already actively participating in the war and that 26 former students were residing in various parts of East Asia under threat of Japanese aggression. in front of Asbury Hall. Japan's surprise attack on the United States naval base at Pearl Harbor in Hawaii on December 7, 1941 and the subsequent declaration of war on the Axis Powers by Congress brought greater changes to the campus than any previous military crisis. The immediate response was an outburst of patriotic display along with jittery nerves and apprehension about the future, particularly among men eligible for military service. The 1942 Mirage reported this reaction: "The Stars and Stripes were uncovered and rolled out the windows; rifles were snatched from corners and platoons were maneuvered about East College...Everywhere students swapped rumors and prognostication; everywhere radios chanted communiques." By February 1942 a local national emergency committee was formed, later joined by a committee of defense, both consisting of representatives of the student body and the faculty and staff. The ordinary round of student activities and social life gradually gave way to community service, farm chores, paper and scrap-metal collection drives, first-aid classes, and accelerated study programs. Before the end of the 1941-42 academic year 37 men had withdrawn from the university to enter military service and another 105 had been accepted, but were temporarily deferred under the provisions of the Selective Service Act. Six members of the faculty, the first of whom was Professor of History Andrew W. Crandall, a World War I veteran, also answered the call to the colors. By fall 1942 male enrollment dropped by nearly 100, and a year later only a handful of civilian men remained on campus, chiefly pre-theological students, conscientious objectors, and those exempted from military duty for health reasons. Faculty ranks also continued to thin as more professors joined various branches of the armed forces. Eventually 22 faculty members saw active military service, and seven others participated in some phase of war work. The possibility loomed of DePauw becoming almost an all-female institution for the war's duration. In November 1942 President Clyde Wildman and Dean Edward Bartlett visited Washington, D.C. to offer the university's facilities for possible use in military training programs, consulting especially with DePauw alumnus Howard Peterson, then a special assistant in the War Department. The Navy showed an interest in the institution's offer and sent a team from the Great Lakes Naval Training Station to survey DePauw's facilities. As a result the university was selected as the site of one of 20 Naval Flight Preparatory Schools (V-5). The first V-5 unit of 200 men arrived in Greencastle in January 1943. Headquartered in Asbury Hall - rechristened the "Good Ship Asbury" - the units were under the command of Naval officers but were taught largely by DePauw professors, four of whom were sent to William Jewel College for an intensive five-day course in navigation in order to prepare them to teach that subject. Altogether 31 members of the DePauw faculty took part in the program, along with 14 other instructors brought in for that purpose, mostly from high schools. Dean Bartlett acted as director, while Lester B. Sands of the education department, who had been a Naval Academy cadet, was named coordinator of the curriculum. Navy Lieutenant Edwin N. Dodge was the commanding officer. Locust Manor became the Navy V-5 administrative center, and the Music School Annex was converted into a military hospital. The men were housed in Longden and Florence Halls and the Delta Chi fraternity house, and marched in formation to classes. By the end of the program in August 1944, 2,463 men had undergone the requisite three months of Navy training on the DePauw campus. Later DePauw was host to another, quite different Naval training program. The Navy V-12, a college training program for qualified students preparing to be commissioned as Naval Reserve officers, arrived in July 1943 and remained until October 1945. Again the resident faculty was responsible for most of the curriculum, which consisted in large part of academic subjects studied in regular college classes with civilian students. Under the command of Lt. 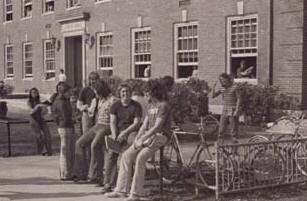 Commander William B. Dortch, the 400 apprentice seamen in the Navy V-12 program lived in Rector and Lucy Rowland Halls. Their number was later increased to 600 after the last V-5 unit departed. 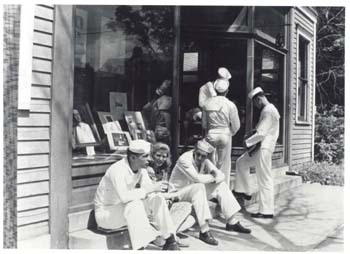 Eligible to participate in athletics, these Navy students made it possible for DePauw to continue in intercollegiate sports competition during the course of the war. Altogether the two Navy training programs played a large role in helping the university survive at a time when there were few civilian male students available. "We have served the nation," President Wildman said in summing up DePauw's experience with the Naval units, "in helping to give training to its officer personnel and we have in turn been helped through some extremely difficult years by their presence on campus."